I find it is essential to our brand that we at Black Manufacturing be personally engaged in every step of the making of our products— concept, design, material selection, and production. When we work with others, we become closely familiar with those people. 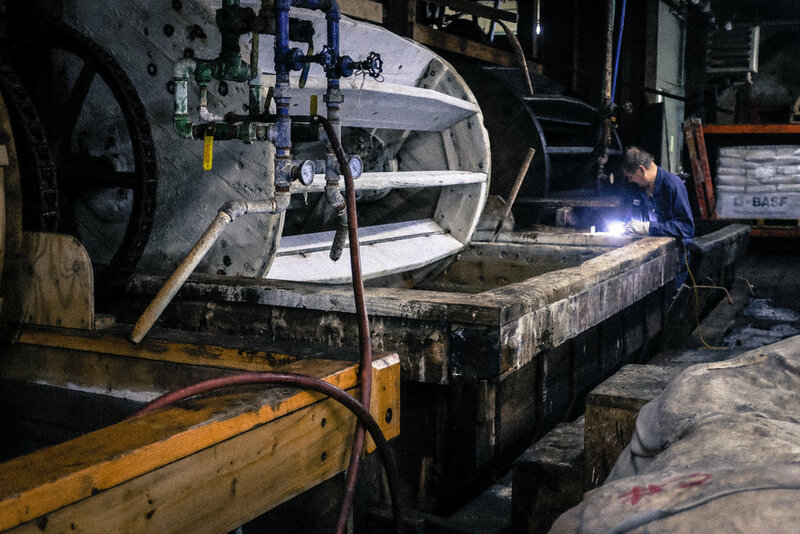 We become as involved as is possible with the people behind the process, behind making. They are often the heartbeat of what makes these products special. We also study and embrace the practices and the history of their companies. To us, the process of making is our story. When I first began my exploration of leather I reached out to Horween Tannery knowing of their reputation for excellence. This relationship has developed into something I never could’ve imagined. I consider myself very fortunate for their guidance and expertise. We at Black Bear Brand strive to offer items of the highest quality, and the people at Horween Leather Co. are a great partner to us on our journey. We've worked with Horween on several Black Bear Brand products, a visit was past due. So when an opportunity recently came about, I was excited to take it. The timing was perfect. We’d just completed the samples of each of our 4 upcoming boots, Nick and I were working on a design for a Horween shirt, and my friend (and Black Bear Brand Photographer) Chad Lyons also happened to be passing through the Midwest. The stars had aligned, and so I shot off for Chicago. The Horween Tannery is located in an industrial area of North Chicago. When I got there that morning, I was taken away by their presence there. 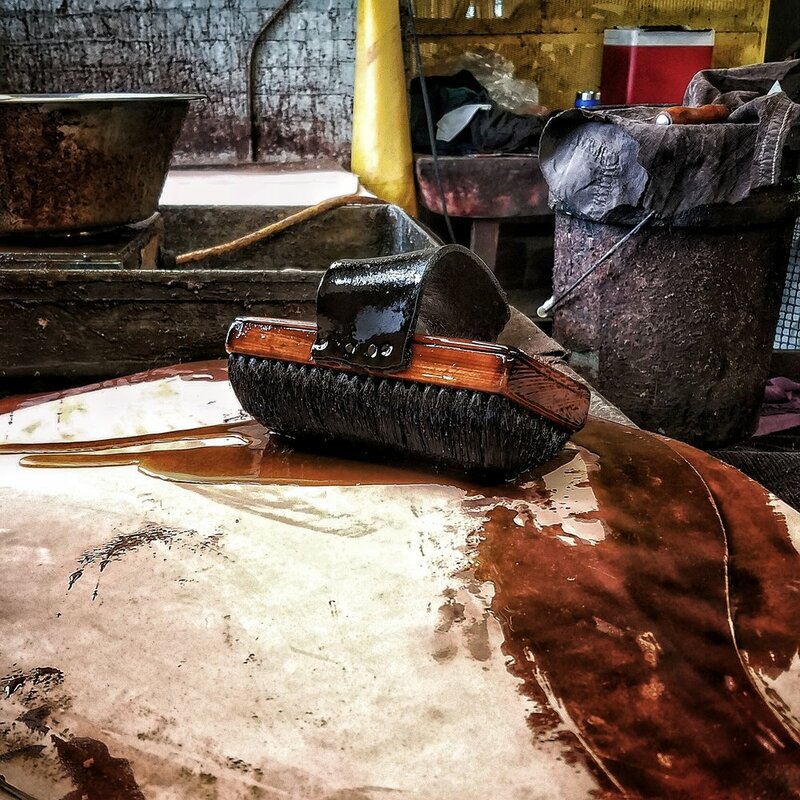 The Horween family has been operating here through 5 generations and for more than a century. The tannery is imposing. It’s all brick, with an unassuming, plain wood door for the entrance. There is a small sign outside that is the only indication you’re at the right spot. The door opens to a small wood stairway that leads to a small waiting room. Everything about the entrance to the tannery is right down to business. It’s direct and purposeful, there is nothing added for flair. There are two church style pews facing each other and a dumbwaiter door where the receptionist greets you. I could feel the history here as I sat waiting; the essence of a place like Horween can’t be replicated. Nick grabbed us out of the waiting room and off we went. He took us through each step of the tanning. We started in the receiving area, where the hides—hair and all—are delivered by truck. The attention to detail was immediately apparent. Every single hide is closely gone over and separated. The separated hides are then sent off with a specific tanning method, and even customer, in mind. Every detail is taken into consideration for the sake of quality. The tannery nearly overwhelms the senses. The moment I walked in the door I was overtaken by a scent that brought to mind an old scotch I used to drink. Walking into the receiving room, where the natural hides come off of the trucks, a heavy, deathly type of smell fills the air. During waxing, oiling, and glazing, you pass pungent odors and then smoothing scents. And the classic smell of leather is pervasive. Some leather types require a good amount of heat, and there are different liquids throughout the place. All these things happening together produce create an actual sensory overload. Each step of the tanning method is involved and they do it at a scale that’s impressive. The Horween Tannery is the real deal, they have been doing it forever and have always stayed true to who they are. In fact, there are actually chalkboards hanging on walls with recipes written on them that look as if they could’ve been there since the beginning. I believe it’s rare to be able to hang onto all the specialness of doing something the same way, and at such an exceptional level for so long, never losing your true character by giving into technology or fads. Horween Leather Company is timeless. That’s not by intention, or by a marketing design. Instead, it’s because that's really how true they are. They simply do what they know works, and by just doing that simple thing, they are totally killer. I feel a connection to the Horween approach. They have a connection to their process and their product that is unmatched; its motivating, inspiring. Skip and Nick Horween, and their deep generational love, devotion, and knowledge to the world of leather, have shown me unlimited future possibilities for the brand I represent. The unwavering need to work with, learn from, and team with the best is what initially drew me to Horween. Black Bear Brand is about learning by doing—being engaged in each process. We design and work with a purpose, and we have a vision to work with others that share a goal to elevate others in producing great items. In getting to know Horween Leather Co., that is exactly what has come to be. And the more I learn from them, the more I realize how much I’m unaware of. The more we learn, the better we become at Black Manufacturing. After making our way through the tannery, we had a chance to sit down and share a little more of what each of our companies do. Horween’s office is scattered with cool stuff, including a handful of NFL footballs that Wilson has been making out of their leather for nearly a century. I brought some of upcoming pieces from our Fall/Winter jacket collection that I thought they’d dig. It was a fun opportunity to share in person some of our stuff that no one has seen yet. My process of design is what I call “curating.” It’s a process that involves multiple parties. One example is the boots that I brought along to show. These boots are made by Dayton Boot Co. using Horween leather, and have been 9 months in the making. I look at them as just a start to the collection that we will be doing with Horween. I’m proud of what we have been able to collectively design and make, and I’m excited to be a catalyst of what’s evolving out of this cooperation. We know that the best of what we can do is yet to come.